Stoller Dental Laboratory’s denture and partial department is committed to delivering quality products to you. Whether you are wanting a traditional denture, injected denture, cast partial, or flexible partial, we are your laboratory. All products are fabricated in house to ensure quality. 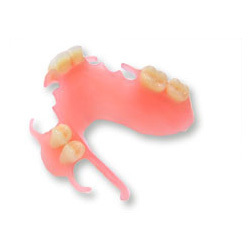 Our dentures are fabricated with high quality Lucitone 199 acrylic and you can choose from a wide range of teeth. Our injectable dentures are our premium denture and we used IvoCap. With injecting dentures, they are denser, stronger, and have less expansion then traditional dentures. Stoller Dental Laboratory cast partials are also made in house with quality metals, either Ticonium or Noblestar to provide your patients with a great oral compatibility. Our flexible partials are fabricated with the TCS system, which provides your patients with exceptional fit and a natural looking appliance. Our dentures and partials, when finished, are some of the most natural-looking dentures, and best fitting dentures you will find.